When asked to review a pair of Genelec active speakers, I felt completely at home, since my reference system includes a pair of Meridian DSP8000 active speakers. I am an advocate of such designs due to their inherent efficiency, which eliminates the passive crossover in exchange for an electronic crossover (or digital signal processor) that separates frequencies, at a specified crossover point, to dedicated amplifiers and then finally to the appropriate drivers. In the end, what you get is a bi-amplified (or more) system in a compact, efficient design, with each driver perfectly matched to an amplifier by the manufacturer. More information on active speakers can be found here. 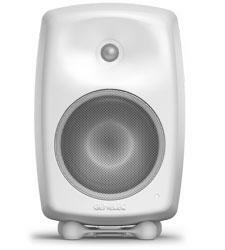 Genelec, based in Iisalmi, Finland, has been manufacturing active speakers since they were founded in 1978. The company's new consumer-oriented line is called the G Series; it includes five models ranging from the entry-level G One to the top model G Five. Genelec offers two F Series subwoofers, the F One and larger F Two, to complement the G Series monitors. Reviewed here are two G Four monitors, with a retail price of $1,595 each, along with the F Two powered subwoofer that sells for $1,795. The G Four is a two-way, ported monitor consisting of a 0.75-inch metal dome tweeter, a 6.5-inch bass driver, an electronic crossover, and dual amplifiers: one for each driver, rated at 90 watts each. The frequency response is rated from 48 Hz to 20 kHz, with the crossover point at 3 kHz. The speakers have both RCA and XLR inputs and outputs. At first glance, you might think the G Four is just another plastic speaker, mainly due to its black or white solid-color cabinet (my sample was white), with rounded corners and a Smithsonian curvaceous shape. This shape often suggests plastic to the unsuspecting; but, once you lift the 19-pound monitor and notice the cement-like density of the cool-to-the-touch cabinet, you realize you are in the presence of greatness, not plastic. The G Four's cabinet is, in fact, made of cast aluminum. 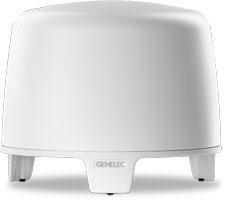 Genelec refers to the design shape as a Minimum Diffraction Enclosure (MDE). At approximately 14 inches tall, 9.5 inches wide, and 9 inches deep, with a coarse matte finish, this speaker does not go unnoticed. The front baffle for the tweeter has a concave shape that Genelec refers to as Directivity Control Waveguide (DCW), which is less about form and more about function. Both MDE and DCW help minimize diffraction and improve frequency response and imaging. The speakers accept a line-level output (RCA or XLR) from any source with preamp functionality. On the back of the G Four is the main power switch, which you can keep on if you use the speakers regularly. In addition, the rear panel houses tone controls in the form of small dip switches, which enable customization for your listening environment. Available settings include Tabletop, Treble, Bass, and Low Bass, which allow for a variety of boost or attenuation settings in 2-dB increments. The Tabletop setting deals with the increase in certain bass frequencies that flat surfaces create when the monitor is positioned, you guessed it, on a table. Lastly, there is an adjustment to boost playback level by 10 dB in case your source's output level is low. The speaker comes with an Iso-Pod stand, a unique, rubber-like pad/stand that the G Four sits on to allow for vertical adjustment (lean back or tilt forward) and help with vibration control. Two sets of threads on the back allow for the use of various wall-mount brackets. The bottom of the speaker has a single threaded hole, to place it on a microphone stand. The F Two subwoofer has a 150-watt amplifier and an eight-inch, down-firing bass driver with a rated frequency response of 27 Hz to 48 Hz. The rounded and ported enclosure is aesthetically similar to the monitors, with the same quality and characteristics. At approximately 14 inches in diameter and 12 inches tall, weighing in at 21.6 pounds, this subwoofer installs easily into a room. Something that I have never seen before on a sub are five line-level inputs and outputs, with RCA connectors, for right, center, left, and surrounds. The F Two is designed to perform bass management on all of those channels, diverting bass frequencies below 85 Hz to the subwoofer. An additional set of right and left XLR inputs and outputs are available, as well. Line-level outputs feed up to five Genelec active monitors, if used in a surround sound setup, and provide volume control with the included wireless remote or optional wired remote. This is just one option - of course, you can connect the monitors directly to a preamp as indicated earlier. A feature I liked was that the right and left XLR and RCA inputs and outputs are wired in parallel, which permits the use of an RCA input and an XLR output - a useful feature if your source is not XLR-compatible or if you have mixed cable connectors available. Like the G Fours, the F Two has bass tone controls and a 10-dB boost switch for line-level input. My first review system included a MacBook Pro running Amarra, into a Cambridge DAC, and then to a Krell 304 integrated preamp, using the line-level outputs directly connected to the G Fours. This setup was located in a smaller room, approximately 12 by 13 feet. My first impressions were huge - a huge soundstage, that is. These speakers sound much larger than their appearance. The song "Black Horse and the Cherry Tree" by KT Tunstall (Eye to the Telescope, Virgin) was incredibly detailed, yet not overly analytical. Vocals had an organic characteristic that was pleasant. The lower midbass was powerful but believable and honest. I moved on to the song "Just Give Me a Reason" by Pink (Truth about Love, RCA) streamed from Spotify. I found the vocals once again to be the standout. Here I noticed not just the accuracy I experienced initially, but also how the vocals appeared to project in front of the speakers creating a fantastic soundstage. Guitar strings took on a three-dimensional character, while percussion instruments had a level of detail that I have heard only on my reference Meridian system. I moved the speakers to my living room, where I connected the G Four speakers and F Two subwoofer directly to an Oppo BDP-105D. I used the XLR outputs from the Oppo to the G Fours and listened to the song "Never Going Back Again" by Fleetwood Mac (Rumors, Warner Bros). Immediately I noticed the output level of the Oppo was not sufficient, so I utilized the 10-dB boost feature of the G Fours and F Two, which put me back in business. In this larger room, the G Fours did not have the same width in soundstage, but the imaging, detail, and overall sound quality continued to be exceptional. I experienced what I would describe as an extremely flat frequency response, creating a realistic balance of a live performance. While the F Two subwoofer did reinforce the lower bass frequencies of the G Fours, I felt that my main room was too large for this compact subwoofer. I prefer a bit more weight in the lower frequencies than what I could muster from the F Two. In larger installations, I think two F Two subs would be in order. This would be easy to accomplish using the "Link" output and input connections, which allows for two subwoofers to be linked together. Another sound-quality characteristic of the G Fours is that they sound good at low volume. Often, speakers will become very mono-like at low volume, then open up as volume increases. I believe this to be another benefit of an active system, due to the elimination of a passive crossover.